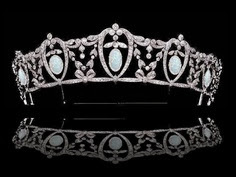 This image is all over Pinterest as the Anhalt honeysuckle tiara. An understandable mistake, as its first appearance was on the Coloured Diamond board right next to the real Anhalt tiara and this one was unattributed. I labelled it as the Anhalt myself, and I should have known better because ‘honeysuckle’ this is not. In any event, opal tiaras are rare and this pretty garland version was welcomed heartily by those of us who love both tiaras and opals. Personally, I don’t like the flower drops. They look rather twee, but it was exciting because adaptable tiaras are as rare as opals, and it’s very satisfying that we had a new one to coo over. It’s a very low resolution image, and it’s impossible to tell if these are pearls (they seem quite lustrous) or cabochon emeralds (it appears that you can see the shank within each tear drop, which of course you wouldn’t be able to do with pearls). The jury is out on this one. I originally thought they were pearls, but the longer I look at it the more doubtful I am. However, until we get a definitive ruling (or a colour photo) then we’ll have to remain uncertain and doubtful. Federica had found it in her copy of Meylan’s “Boucheron: The Secret Archives.” In case you’re wondering, the book’s on my Christmas list and the husband has promised faithfully that it will be in my stocking on Christmas morning. Until then, I have to get my Boucheron thrills second hand. Now it may seem sad to you, but for Federica, Edie Engel and me, this was a moment of high excitement. 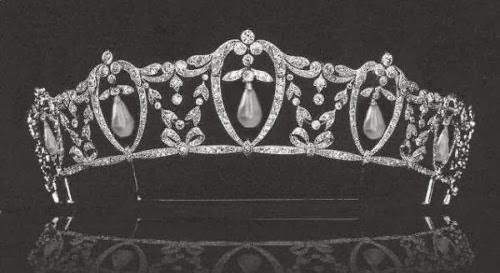 We had a fourth form for this tiara, we had a maker, a date, and the name of the woman it was made for. For tiara lovers, there can be no finer sense of achievement. And what a story is connected to it! Barbara Kelch - Varvara Petrovna Bazanova – was the wife of Alexander Ferdinandovich Kelch, a Russian nobleman who lived in St Petersburg at the end of the nineteenth century. He is now known mainly as a patron of Fabergé, having commissioned seven eggs for Barbara, one each year from 1898 - 1904. These eggs are famous ones in the Fabergé aficionado circle, and deemed to be of the same quality as the ones Fabergé made for the Tsar and the Imperial family. One or two are considered outstanding examples of the art. More on those in a moment. 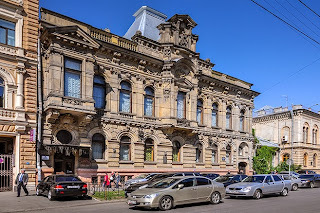 Alexander Kelch was a titled industrialist and gold magnate who married Varvara (Barbara) in 1894. Her family had made a fortune in Siberian industry, particularly gold-mining. Just two years previously, she had married Alexander’s brother Nikolai, but he died very early and her wedding to Alexander appears to have been arranged to keep the two merchant families allied. To begin with, they didn’t live together: she was in Moscow and he lived in St Petersburg. In 1896, the couple bought a mansion at 28 Sergeevskaia Ulitsa in one of St Petersburg’s most fashionable areas, for 300,000 roubles. 1902 Rocaille Egg (now in the McFerrin Fabergé Collection housed in the Houston Museum of Natural Sciences (http://www.gia.edu/gems-gem... ). If you want to know more about the eggs then the Encyclopaedia is the way to go, since this is all I’m going to say about them here. Frankly, Fabergé eggs leave me pretty cold. His few tiaras, now, are a very different kettle of fish. 1904 marked the high point in the finances of the family. The Russo-Japanese War of 1904/5 destabilised the economy so badly even wealthy families suffered and the couple separated in 1905 with Barbara moving to Paris. According to Orthodox tradition, the marriage was formally annulled ten years later. She must have taken a lot of her belongings with her, because in 1920, six of the eggs (all but the 1899 12-panel egg)were offered for sale by the Paris jeweller Morgan and sold to Jacques Zolotnitsky, whose nephew sold the eggs on to an American buyer in 1928. Alexander worked in the mining industry in Siberia and remarried. He returned to St Petersburg in 1924, and was in correspondence with Barbara as four years later she was urging him to come to Paris. He opted to stay with his new family, aware that Barbara herself was short of money. He was arrested in 1930, tried, and sentenced to hard labour. It’s thought he died in a Siberian gulag. 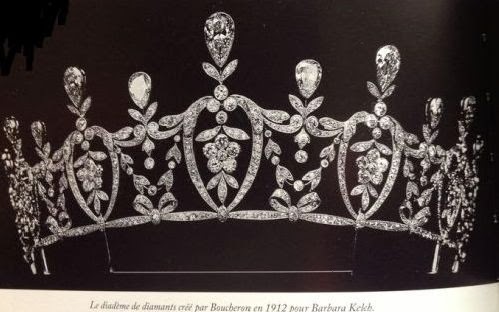 So far, no information is available on Barbara’s life after this and until I get hold of Meylan’s book for myself, I probably won’t be able to update with information on the fate of the tiara. So there you have it. The story behind one of the prettiest adaptable tiaras around. Ethereal theme. Theme images by LordRunar. Powered by Blogger.